A couple of weeks ago, we made a cherished favorite, monster cookie dip. We don't dip anything in it, we just eat it with a spoon. I justify that it is healthy because there is oatmeal and I used 1/3 fat cream cheese, that counts as healthy right?? Use an electric mixer or the kitchen aid to mix the cream cheese, peanut butter and regular butter together. Next add in the powdered sugar a little at a time. Mix in the brown sugar and vanilla. Slowly add in the flour and oats until the texture is to your liking. Then, fold in the candy and chocolate chips. We ate on this batch for a few days. The first day, I ate so much, I think I made myself sick, but it was worth it! One more precious day with my babies, how does this happen?!! For the past few weeks we have been soaking up the fun! The neighborhood block party was a blast! Performing science experiments with tums and sprite, it was interesting to say the least. Callie tried out daddy's guns, she is good shot like her mama! We drove by all of the landmarks in my OLD neighborhood. Here is the first house my parents lived in when I was a baby, it has seen better days! Some one cut off all of her lovely hair, she looks so much more grown up! Callie dug out her build-a-bear and we found out it was Rainbow Butterfly's birthday, that day. So, we had to have a party. We are finally getting back to work on the backyard, little by little. Hello mulch, good bye dirt pit. A much needed night out in Lo-Hi, kidless and wandering downtown! Summer is coming to an end at the Wood house, I am so sad. This summer has been so much fun! I really hate to see back to school ads and swimsuits on clearance. Callie is leaving for Texas in 2 days and it's back to school for Kellen and I on Wednesday. For make something Monday last week, Callie's craft was a bit of a flop. She wanted to make another batch of edible paint, but by the time we got it all made, she was over it and just wanted to eat everything. We found the recipe here. We followed it pretty exactly and it came out beautiful, but more tasty than artsy. We followed the recipe pretty exactly but doubled it. First you measure 2 cups of mini 'shmallows in a bowl and heat in the microwave for 30 seconds and stir. Then add 1/2 cup of water and stir some more. Next put it back into the microwave for another 30 seconds. Stir until all of the marshmallows have dissolved. Next, add in 6 tablespoons of light corn syrup, stir and, you guessed it back to the microwave for 30 second. The stir until everything is dissolved. Then evenly distribute the mixture into cups or bowls and add your food coloring. We used 2 drops of each color and that was plenty. Now get to work making masterpieces! Callie got super creative and decided to paint the picture using big marshmallows. Then she decided to "Glue" the big ones to her picture using the paint. It was clearly more fun to eat than to paint with! Now, for grown up crafts! I made these a while back, but they are super fun and way easy. First you have to get the label off the bottles. I soaked mine in the sink, that got most of the paper off. Then I sprayed them wd-40 to dissolved the glue and scrubbed it off with a scour sponge. Make sure they are thoroughly dried and paint. I did 2 coats to get solid coverage. After they dry you can write on them! I had the"love" on them for a while, then my lovely husband wrote "fart" on them, he thought he was pretty clever. Last week, Callie and I decided that we wanted to go to the water park for our Friday field trip. I talked to some of my girlfriends from church and they recommended some places. I looked into it and decided that Pirates Cove would be our best bet. It is a little smaller and a little more affordable, so I started planning our adventure. My sister in law works from home as an accountant and she had Friday free and it was supposed to be hot, so she graciously joined us. Life lesson #1 When you are out numbered... Bring a friend or family member with you! I was thinking this would be good because I don't mind keeping two children home with me during the day, but at a water park there is safety in numbers. Jenn planned on going on rides with Callie and I could keep Kellen busy, everybody wins. Life Lesson #2 The early bird gets the worm. I thought I did my research by checking reviews about the Cove before we left that morning. All of the advice said get there early. The park opened up at 10, so we left at 9:30 and got there right after it opened and ba-bam three giant school buses showed up and unloaded like 10,562 children and it was "Good luck finding a spot." After a bit of searching and prayers we found some beach chairs at the end of a row and snagged them quick. We all got sunscreened and changed and were ready for action! Life lesson #3 Swimmy diapers are useless...unless you are in the water. I had this brilliant idea that I would have everyone ready to go, so we could whip off our cover ups and get right to the pool. I put Kellen in his lil' swimmers diapers and put on his trunks before I strapped him in his car seat back at home. When I took him out to go swimming and he was already soaked. With pee. I had no idea that swimmy diapers don't work like real diapers, he and his car seat we absolutely dripping. With pee. I did what any good mom would do. I wiped him down with wipes got him a fresh diaper and set his stroller in the sun to dry. (I washed it immediately after we got home, don't worry) Kids. Are. Gross. Life lesson #5 Save money, bring a picnic. After the height debacle we decided to head back up to the splash pad again, but it was empty and the life guards were standing around fending off parents and children; see lesson 6. We decided that now would be a good time for a snack or lunch. We headed back to the chairs for lunch. The reviews said that food is super pricey so we opted for turkey sammiches and peanut butter filled pretzels, yum! After we were full and happy the splash pad had opened back up. I took squirmy Kellen to splash and Jenn and Callie headed to the lazy river. More fun was had. Life lesson #6 Go to the bathroom...before you leave home. Remember back when I said that the splash pool closed down and the life guards we guarding, well, I overheard someone saying that a kid had an accident in the pool. They got out the nets, the chlorine and kept the people away. Why, oh why do kids do that?? Poop in the pool. Go before you leave home people. Kids. Are. Gross. Life Lesson #7 Check the weather report... before you leave home. After the poop fiasco, the height fiasco and all the other shenanigans, we were finally having a great time...When the wind kicked up and the sky turned grey. No storms, but it was cool and yucky. So we decided to take the blue lipped children and dry them off and head home. Bummer. So overall it was a crazy day, the kids had fun and things were learned, so I guess that's what matters! Kellen is 10 months old! This month has been wild crazy with you Mr. Wood! You are a mess! It seems like I finally get used to you being one way and the next day you are totally different, stop growing, please. You are my happy man, still always smiling and laughing, especially with strangers. You are a total flirt. I mean, look at you, big goofy smile, sweet brown eyes, pink chubby cheeks, what's not to love?? And you learned to wave at people, you are the ultimate friendly baby. We have been working on blowing kisses but mostly you just end up licking your hand! You have so many silly faces and giggles and noises. You have said da-da a few times, but it's hard to tell if you are actually saying it or just babbeling. You have slowed down on your eating (a little) I think it's because you are into everything and are more tired than hungry sometimes. We have stalled out at 24 lbs this month. This month you are flying through the house at full speed, into stuff and onto stuff, I can hardly keep up with you! You creep along the edge of anything that you can pull up on, I think walking is in the cards and soon! The stairs are still fun, but you are figuring out how to climb them, yikes!! Uh-oh, time to for childproof cabinets thingies! You love to play with your toys! If it rolls or is a ball, it's in your hands. One day you snagged a cat toy off the shelf at the dollar store and I had to buy it because it kept you so busy! You love to play with Callie, there is something about you two that makes my heart melt! She is the only one who seems to keep you happy when you are upset! You don't know how to be still! When I try to rock you, you roll away out of my arms or try to hang over the side! You have almost out grown your swing, one morning I found you hanging upside down trying to get out of the buckles! Changing your diaper has become quite the feat, as you do a crocodile death roll as soon as you hit the changing table. This month your photo bomb faces have reached to hilarious heights, will you ever take a smiley picture without being bribed? Who knows?! I am so sad that this month is almost over and I have just a few days to spend with you and Callie. But, for now, I will cherish every snuggle and hold you until you claw at me to put you down, because I know that next month you will be a whole new adventure! Loves: Callie, cars and balls, eating, books, Jake, getting into stuff, splashing in any kind of water, singing and music! Not a fan of: Teething, being alone in a room, sitting still. Firsts: Time at the lake, 4th of July, fireworks show, time waving, trip to the water park, walking along the furniture, time climbing stairs. This week was a boring week clothes wise, I pretty much wore my swim suit and a cover up or workout clothes to play and do some last minute summer yard work in. Next week will be far more exciting because, alas, summer vacation only has 8 days left and it will be back to work for me. I wore this little outfit to our neighborhood block party on Saturday, because it was outside and it was HOT! Then I saw this pin on pinterest from one of my favorite B-logs and I felt pretty in style. Now I just would like a super cute hot pink bag! White Trash Enchiladas, so tacky and so yummy! This here is a yummy recipe that we love to eat in the summer time and I am little ashamed to admit I feed to my family! I don't know what it's really called, but we call it white trash enchiladas. I am pretty sure that it is terribly unhealthy, but Callie and Brien will eat it, so I had to share. 1 package of hot dogs, I use turkey or all beef dogs on this one to try to healthy it up... a little. 2. Line or grease a 9x13 baking dish. 5. Spread the 2nd can of chili over the tortillas. 6. Cover the whole she-bang with cheese. 7. Bake covered for 30 minutes, and 2-3 additional minutes uncovered to melt the cheese. Eat and pray you don't have a heart attack! One of the things on my to-do list this summer was to get some functional and cute decor going in my laundry room and powder room. I am almost done! Yay! It still needs some finishing touches. I need a cute rug, and I have something that I want to hang in the bathroom, but it is currently taking up residence in my dining room. Oh, the dilemmas of decorating...I kid. Enter my brilliant ideas to save money! I made some signs and such! 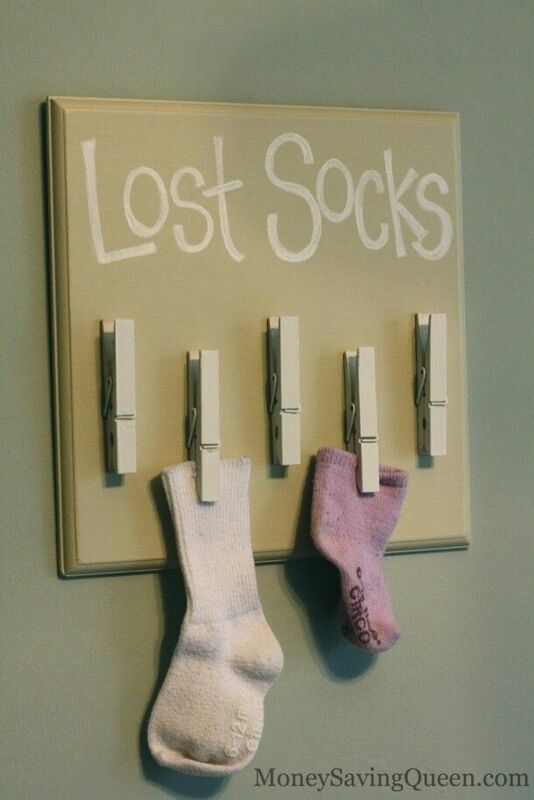 First, I wanted to make a lost sock sign. Callie is the official sock folder of the Wood family and every week she has a few left overs. She calls them "Bullies", that's what she wanted me to put on the sign. I opted for just "Lost Socks". It came out pretty well! It was so super easy... I found a big old piece of wood in the garage. It was not in great shape, but I thought it have it a little bit of a rustic touch. Our laundry room is kind of a minty green color, so I thought a nice coral color would look super. I made a wash with a squirt of paint and some water and painted the board. While it dried I painted the clothes pins, I had some on hand from a project that Callie did a looonnngg time ago. I painted them a random mix of coral and white stripes. Then once the sign was done drying, I free handed the lettering. My lettering never comes out well when I free hand, but this was pretty good, for me, so I left it as is. Once everything was totally done drying I hot glued on my clothes pins and there you have it! Total cost: $1.89 for the paint! Here it is all hung up! I was so excited when I finished it, I begged the mister to hang them at like 10 pm! The other signs I got at Hobby Lobby for 50% off. I love how it all came together and now the laundry room feels finished! 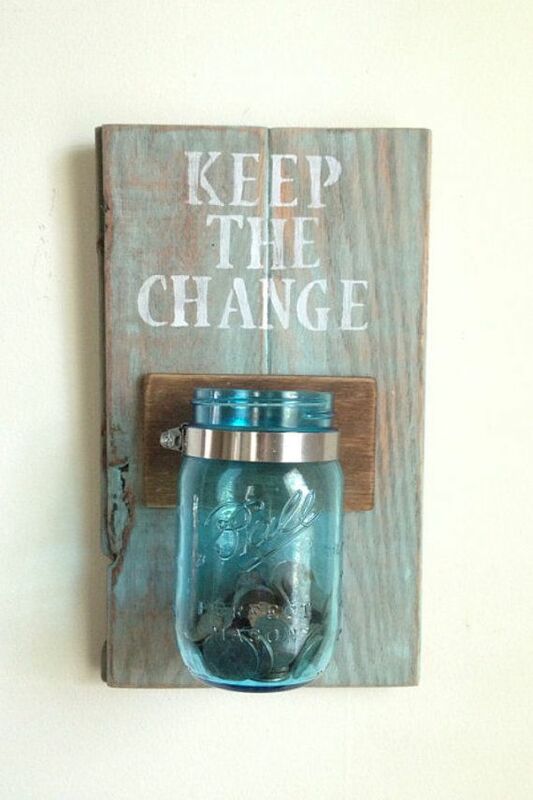 Another project I wanted to make was a mason jar rack to store things in, change from the washer, pens for the calendar and treasures I found in the dryer . I had seen one at Target a few weeks ago for like $30, no thanks, Target. I will make my own. This one was a little more complicated and required some man help with measuring! I found an old fence picket that had been left out in the rain at my parents house that was the perfect length. Then I made another wash using white acrylic paint and water and slathered it on the board. 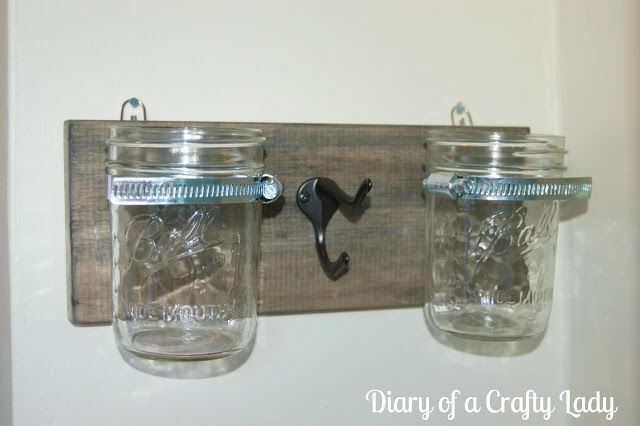 I used 3 1/2 inch ducting brackets from Home Depot for like a dolla' and a 12 pack of regular sized mason jars at Target for $9 to create my masterpiece. I love how it came out!! Okay one last thing... 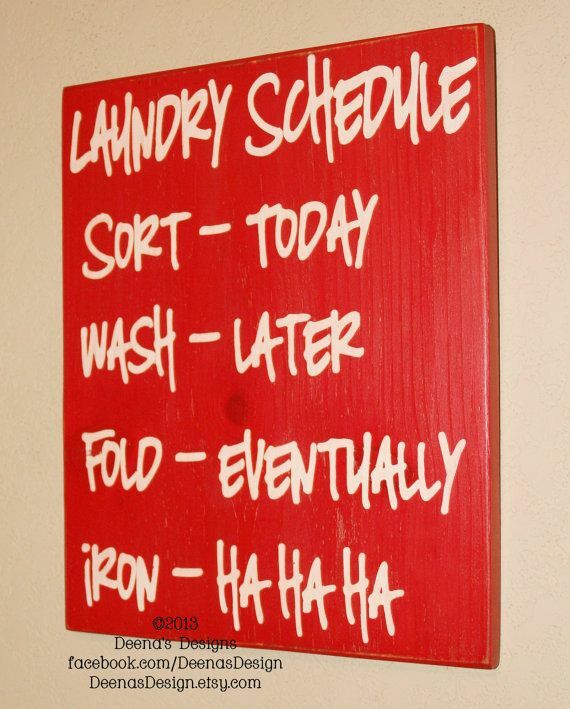 I wanted to have a calendar in the laundry room as well. We always go out through the garage door and grab our coats and such from the "mud room" and I thought it would be nice to have a calendar to check with, since we are always so busy!!! I don't love how this came out because it's a little small, so it might not be permanent, but it will do for now! It will have to suffice for now. Now I can check the laundry room off my summer bucket list, except for a few minor things, it's done!